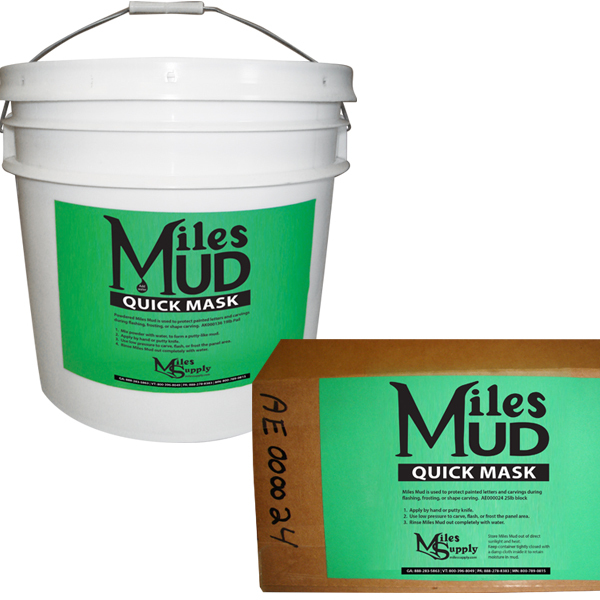 Miles Mud is used to protect painted letters and carvings during flashing, frosting, or shape carving. 1. Apply by hand or putty knife. 2. Use low pressure to carve, flash, or frost the panel area. 3. Rinse Miles Mud out completely with water. Powdered Miles Mud is used to protect painted letters and carvings during flashing, frosting, or shape carving. 1. Mix powder with water, to form a putty-like mud. 2. Apply by hand or putty knife. 3. Use low pressure to carve, flash, or frost the panel area. 4. Rinse Miles Mud out completely with water.